The XXII Winter Olympic games are underway in Sochi, Russia and for the next 2-1/2 weeks all eyes will be on the international winter competition. Popular completions including figure skating, bobsledding, ice hockey, speed skating, alpine skiing, snowboarding and more are expected to be watched by millions across the globe as athletes from around the world gather to compete. Like many previous Olympic Games, the Sochi games are not without controversy. Russia’s stance on human rights and laws against the support of gay and lesbian lifestyles, have received widespread criticism around the globe and even search engine Google has taken a stand today with home page today graphic featuring the Olympic charter. Google’s timing of this issue at the outset of the games has spread more widespread awareness of this issue and was heralded in many publications throughout the globe. Timing is extremely important during both the Winter and Summer Olympic games and prestigious watchmakers Omega and TAG Heuer have been the official time-keepers of the Olympics for many decades. TAG Heuer has been the Official Olympic timekeeper of both the 1980 Lake Placid and Moscow Olympic games. The brand was also the Official timekeeper of the three Olympic games during the 1920’s. TAG Heuer is widely associated with sports competitions and is renowned for its precise time-keeping accuracy. 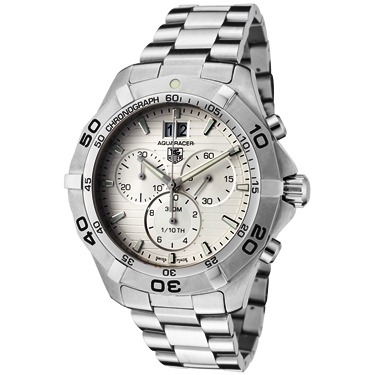 You can discover a wide array of TAG Heuer watches for men and women at The Watchery. The TAG Heuer Aquaracer Chronograph is the ideal watch for keeping pace with both winter and summer sports. This outstanding timepiece has a stainless steel case and matching triple link bracelet. The unidirectional rotating bezel with embossed markers encircles the silvery gold chronograph dial with an automatic date calendar, 1/10th of second, small-second and 30-minute registers. Features include precise Swiss-made quartz movement inside and water resistance to 300 meters. Watch is 43mm in diameter and 11mm thick.